"My treat" are 2 words any foodie likes to hear. C'mon, you get to eat for free! Well, Travel Guy and Photo Mama wanted to treat Viv and I for a meal at a restaurant of our choice. Too bad I've already visited Gotham lately eh? Hehe... Not trying to be too greedy, we decided to go to The Sandbar. 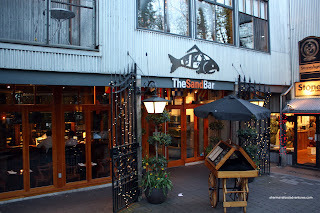 Part of the Sequoia Group of Restaurants which include The Teahouse, Cardero's and Seasons in the Park, The Sandbar along with Cardero's are the more "casual" restaurants. I would group them into a category which includes Milestone's, Cactus Club and Earl's. The one difference is that they belong to a "group"; rather than a "chain". Somehow, I feel that distinction is becoming more and more the same. However, in this case, I do believe that each of the restaurants do offer something a bit different. The last time I was here, I had the Caesar Salad. What's so special about a Caesar you ask? 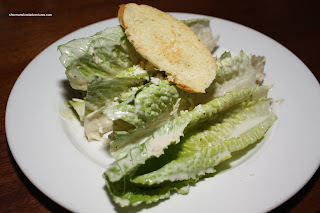 More and more places are beginning to serve their Caesars with whole pieces of romaine hearts. The premise is that the lettuce will be much more crisp and suffer less deterioration from the dressing. Indeed it does since each piece was crispy and there was just enough dressing along with asiago. The addition of crispy capers added a nice crunch. For my main, I had the Red Snapper from their fresh sheet. 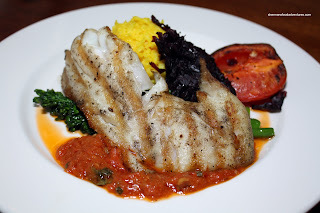 It was accompanied by broccolini, red cabbage, grilled tomato, saffron rice and a fresh tomato compote. Honestly, I wasn't that happy with this dish. The snapper was quite overdone and the meat became a bit chewy and hard in some spots. Also, the rice was downright terrible. It came in a big clump that could barely be broken down. Essentially it was a dry rice ball. Travel Guy, soon to be Teacher Guy, went for my other choice (which I should've had instead of the snapper) which was the Seafood Hot Pot. Given it's price, we weren't expecting a tonne of seafood. And that was mostly the case here. 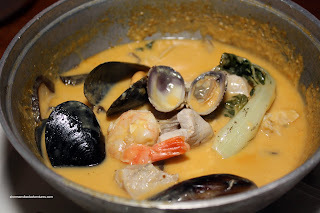 Despite the lack of ingredients, the red curry was actually pretty good. Naturally it was more coconut than spicy since it's suppose to appeal to the masses. The seafood was not overcooked and he said it would be a dish he'd order again. Viv and Photo Mama both opted for the Salmon Burger. Viv thought the salmon was perfectly executed being moist on the inside and nicely grilled on the outside. 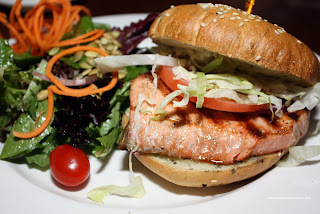 A well made salmon burger; yet probably not worth $15.00. Okay, I know some of you will point out that given it's location, the prices would be reflective of that. However, the bottom line is whether this meal was good enough to warrant high praise. Given that this is not my first time at Sandbar, I would have to temper any criticism with the positive visits in the past. However, based on this current visit, it appears that The Sandbar is only a passable restaurant compared to equally priced establishments. For example, my snapper dish for $22.00 is equivalent to The Cannery's (now closed) snapper I had off their fresh sheet. However, it was much better executed at The Cannery for the same price. Thus, as a measuring stick, it doesn't stack up. By no means was our meal bad; in fact, it was good in some points. As much as I think the Sandbar is generally quite decent with an awesome location, they cannot afford to rest on their laurels. the big question remains: was the bread cold? :P too bad about the snapper but did you consider sending it back? personally i have a hard time doing that but there's no excuse for overcooked fish. the budget oriented university student in me thinks that you should get what you pay for! Trisha, I never even thought about sending it back. I really should have. 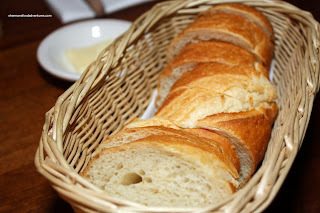 As for the bread, it was cold, but it was soft!